small children who love nature and look for a medium or even large hotel, offering them a wide range of services and high-level activities. The elegant Hotel Laguna - Chia Laguna is situated within a large tourist complex situated in the beautiful Coast of the South, approx. 50 km from Cagliari, the main town of Sardinia. The locality, well known for its high sand dunes, it is called Chia and in the summer season is the favourite place for thousands of tourists and visitors. The distance from the Hotel Laguna to the beach is about 700 m.
If you arrive at the airport of Cagliari, the distance is 58 km, while it is only at 6 km from Domus de Maria, the nearest village. 20 km separate it from Teulada and 18 km from Pula. In the heart of the Chia Laguna, the 5-star Hotel Laguna imposes and distinguishes itself for its class and elegance, with its terraces and private gardens. The Chia Laguna features in all 4 hotels (Hotel Village, Hotel Baia, Hotel Spazio Oasi and of course Hotel Laguna) for a total of 650 rooms, luxury villas and 3 residences. The Hotel Laguna, more suitable for couples and customers in search of a sophisticated ambience, it is a real gem that offers a wonderful view over the lagoon and on the Spanish tower that dates back to 1200: a great panoramic view that will remain impressed in your eyes and will accompany you even after the end of your holiday in Sardinia. Next to the Hotel Laguna there is the Hotel Village, consisting of 300 cottages with 2 or 4 beds and ideal for families with children. Hotel Laguna guests can share with the Village customers the 3 swimming pools, the private beaches, the resort facilities and the common areas. For breakfast and dinner, the guests of the Hotel Laguna have access to a beautiful open-air restaurant overlooking the lagoon and the sea. The evening entertainment for all the guests of the Resort proposes piano bar in the piazza, music in the pizzeria, shops and evening activities for children throughout the season. The 80 rooms of the Hotel Laguna are distributed over 3 floors and decorated in a sober and elegant contemporary style with references to the Sardinian tradition. All rooms and suites are spacious and bright and have a balcony or a terrace or a private garden overlooking the beautiful bay of Chia and the lagoon inhabited by pink flamingos. The rooms are divided in different categories: Superior, Deluxe, Junior Suite, Garden Junior Suite, Garden Suite and Suites. The spacious Superior rooms have 2 beds and a terrace or balcony; the Deluxe rooms are more spacious and can accommodate up to 3 beds (3rd bed on request) and have a terrace with sea view; the Junior Suites and the Suites can accommodate up to 3/4 beds (3rd/4th bed on request) and have an adjoining living area, a terrace or a private garden with sea view. All are equipped with the comforts of the modern technology: internet access Wi-Fi complimentary, LCD satellite TV, air conditioning, minibar and safety box. The Presidential Suites of the Hotel Laguna assure the maximum comforts: the Luxury Panorama Suite with a surface of 140 sq.m. 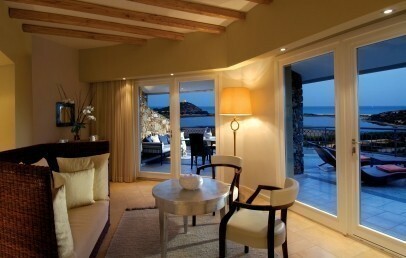 and a private plunge pool and the Natural Prestige Suite with a surface of 80 sq.m. Both offer a stunning sea view, a stylish decor, spacious and bright living areas and VIP services included. At the beach is a reserved area dedicated to all guests staying at the Hotel Laguna, free from the third row (first and second rows are subject to charge, except for some room types). The Wellness Centre Chia Natural Spa is available with qualified staff and a wide choice of treatments for those who want to relax and at the same time take care of body and face. The guests of the Hotel Laguna have direct access. The Chia Laguna offers many activities to its customers. Among these, available against payment, we can mention: the tennis courts (clay and hard courts), bicycle hire, horse riding, cycling and quad, football, gym, water sports at the beach Campana (sailing boats, wind surfing, pedalo, scuba diving and boats for excursions) and golf lessons in the near Pitch & Putt. The guests of the Hotel Laguna have a dedicated restaurant for breakfast and dinner. In total the Resort has a 9 restaurant and offers the possibility to book the Dine Around Program to taste delicious local, national and international dishes, every night, in a different à la carte restaurant with a dedicated Dine Around Menu. According in which hotel/room you stay and in which restaurant you choose to dine, there is a variable supplement and a table reservation is required. The new restaurant Bioquam by the pool is exclusively dedicated to guests of the Hotel Laguna. It offers light lunch menus and snacks to pay attention to the well-being and physical health. Elegant atmosphere with sun terrace, lounge zone and panoramic views surround this restaurant. For the younger guests in each restaurant proposes a special child menu, while the Bimbi Restaurant is dedicated exclusively to children. Guests of the Hotel Laguna, a haven of relaxation and comfort of the Chia Laguna, have several services that they can share with all the customers of the Resort: 3 swimming pools, nursery, kid's club and junior club (until the age of 17), entertainment service, beach service, a little train with open carriages for the transfer from the beach and back (connections every 15 minutes), travel agency and car rental. They also have the opportunity to make shopping and have evening entertainment in the Chia Laguna’s main Piazza and at the Luna Club (a short walk from the Hotel Laguna). Discover all the detail about the Chia Laguna Services. A double room decorated in a sober and elegant, contemporary style with references to the Sardinian tradition. Characterized by home accessories and natural fabrics that create a cosy and comfortable setting. The bathroom has a shower. The rooms have a terrace or a balcony with a partial Lagoon/sea view. On request it is possible to add a baby bed for a child up to 3 years. Spacious double room decorated in a sober and elegant contemporary style with references to the Sardinian tradition. Characterized by home accessories and natural fabrics that create a cosy and comfortable setting. The bathroom has a shower or a bathtub. The room has a great view over the sea and the lagoon. It is possible to add a child bed (child’s age up to 12 years) or a cot for a child up to 3 years. An open space Junior Suite with night and day zone. Comfortable for a couple and also for a family up to 4 people: 2 adults + 1 child until 12 years + 1 baby until 2 years or 3 adults + 1 baby. The decoration is sober and elegant in a contemporary style with references to the Sardinian tradition. Characterized by home accessories and natural fabrics that create a cosy setting. The bathroom has a shower or a bathtub. The Junior Suite has a terrace with loungers and great view over the sea. Guests have in the second row on the beach, one sun umbrella and loungers reserved. An open space Suite with a night and a day zone, decorated in a sober and elegant contemporary style with references to the Sardinian tradition. Characterized by home accessories and natural fabrics that coordinated with each other, creating a cosy and comfortable setting. The bathroom has a shower or tub. The Suite has a furnished, nice terrace offering a great view of the sea. On the beach, guests have in the first row, a sun umbrella and loungers reserved. This Suite can accommodate up to max. 4 people: 2 adults + 1 child until 12 years + 1 baby until 2 years or 3 adults + 1 baby. 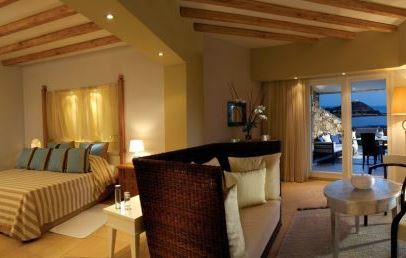 The Garden Suites are among the largest, sunniest and most beautiful room of the hotel. They have a night and day zone and are decorated in a sober and elegant contemporary style with details to the Sardinian tradition. Characterized by home accessories and natural fabrics that create a cozy and comfortable atmosphere. The bathroom has a shower or bathtub. They feature a private garden with a Jacuzzi pool and overlook the lagoon and the sea. Guests have in the first row on the beach, a sun umbrella and loungers reserved. Upon request and without any supplement a baby bed and a child bed, for children up to 12 years, can be added. The Garden Junior Suites are comfortable and spacious with a cozy atmosphere. They have a night and day zone, decorated in a sober and elegant contemporary style with references to the Sardinian tradition. The bathroom has a shower or a bathtub. The Garden Junior Suites have a private garden and view over the lagoon and the sea. Guests have in the second row on the beach, one umbrella and loungers reserved. On request it can host a baby bed and a child bed for children up to 12 years. A beautiful spacious and bright suite with a bedroom and a separate living room with panoramic view. The decor is elegant and simple in contemporary style decorated with details and natural fabrics. The Natural Prestige Suite offers a bathroom and another bath/toilet. The large terrace is furnished with Mediterranean plants and equipped with sun loungers, table and chairs. The Natural Prestige Suite can be connected to a deluxe room (on request, subject to availability) for large families or friends. Exclusive services included: butler service; transfers to/from Cagliari-Elmas airport; VIP treatment on arrival; shuttle service to the beach; beach service reserved in the front row in the VIP area of the Campana beach; umbrella and sunbeds at the Bioaquam pool; access to the Bioaquam path at the Chia Natural Spa; room-service for breakfast; Dine-Around free of charge in all you restaurants of the Chia Laguna Resort. The Luxury Panorama Suite is located on the top floor and has a large 140 sqm terrace with a private infinity whirlpool offering a fantastic view over the entire wonderful area. The decor is elegant and simple in contemporary style decorated with details and natural colours and fabrics. The Suite offers a living area with dining and sitting area, a bedroom with bathroom, a studio, a dressing and a small additional bath/toilet. Special Early Booking: 15% reduction for bookings confirmed within April 30th 2019 (stays from July 1st to August 31st)! Special Early Booking - partially Not Refundable: 25% reduction for bookings confirmed within April 30th 2019 (stays from July 1st to August 31st)! 25% of the total amount of the reservation is not refundable. For customers staying in a Luxury Panorama Suite, Natural Prestige Suite, Garden Suite or Suite: beach service in the first row included. For customers staying in a Garden Junior Suite or Junior Suite: beach service in the second row included.